Crime at this year's Glastonbury Festival rose to the highest level since 2003, according to new police figures. But Mendip District Council insisted the festival was possibly the best-managed in the world and had won praise from the Environment Agency, Somerset Primary Care Trust, police and fire and rescue authorities. Recorded crimes dropped to an average of 467 at the three previous festivals in 2004, 2005 and 2007. But new statistics show crime was up 78 per cent at this year's festival with 751 crimes reported compared with 422 in 2007. The figures included two rapes, the highest number during the five-day festival since 2000. Police blamed the increase on a weekend of good weather and slow ticket sales allowing touts to sell to organised criminal gangs waiting at the gate. Police superintendent Adrian Coombs revealed the figures in a report to Mendip District Council, which grants the festival licence. He said: ''The weather this year was mainly dry, with prolonged periods of sunshine. Research would suggest the better the weather the higher the crime levels are likely to be. ''This appeared to be the case at this year's Festival where crime levels were very similar to the levels in 2003 when there was also a weekend of good weather. 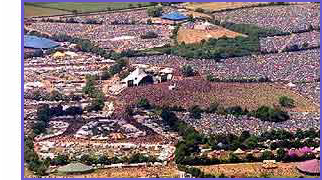 The 2004, 2005 and 2007 festivals were renowned for having particularly poor weather." Among the crimes were 412 thefts, 177 drugs offences and 110 pick-pocketing incidents. Arrests increased to 199 compared with 183 in the previous year. Police believe the majority of the thefts were from tents or people being pick-pocketed in packed crowds. Superintendent Coombs said: ''Unusually, tickets were still available for sale this year on the lead up to the festival. "The likelihood of co-ordinated groups of people being able to gain legitimate entry to the festival site was therefore increased when compared with more recent festivals and this may have had an impact on the crime levels. "The increase in crime can largely be attributed to the number of 'other theft' offences, mainly theft from tents, which were predominantly reported on the Wednesday and Thursday of the festival." Festival founder Michael Eavis said that the late sale of 20,000 tickets without photo identity, which may have contributed to the problem, would not be repeated next year. All festival-goers must register with photo identity. Tickets went on sale on October 5 and 90,000 have already sold at £175. Festival-goers can also book a ticket with £50 deposit and there is no restriction on the number individuals can buy. Mr Eavis said: "It has gone even better than my wildest dreams imagined. "We wanted to give people the chance to decide early whether to come here. "Unfortunately crime figures were up this year, but it was probably the best-organised event in the world of its kind, and you can't get a better report than that."